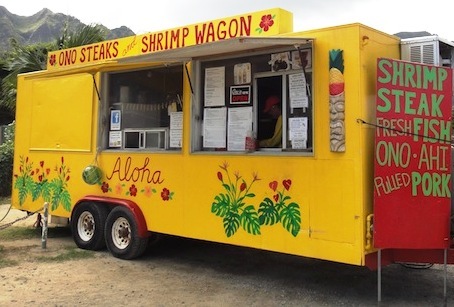 Ono Steaks & Shrimp Wagon is owned and operated by Waimānalo homesteader Alfred "Keoki" Edmond and his wife Corrie. WAIMĀNALO, O‘AHU – The high cost of doing business never stopped Waimānalo homesteader Alfred “Keoki” Edmond from starting his own business. Keoki, along with his wife Corrie, run Ono Steaks and Shrimp Wagon, the bright yellow lunch wagon parked along Kalaniana‘ole Highway, right in his hometown. “I’ve lived on the Waimānalo homestead since 1973 with my grandmother and grandfather who raised me. I still live in the same house,” said Keoki. In 2009, Keoki’s work in the construction industry slowed considerably, so he went into the food business. But even after acquiring the lunch wagon itself, he needed to find a facility large enough to prepare, cook, and clean, his food. Operating a start-up didn’t exactly afford him the luxury of buying his own equipment, let alone his own place. 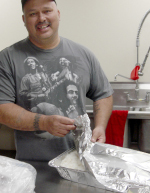 That’s when he started renting the community kitchen at Ka Ho‘oilina Na Kūhiō Community Center in Waimānalo. Ever since, he uses it daily. This five-year-old kitchen is fully equipped with sinks, stoves, and counter space, large enough for catering food for large parties. The kitchen is also certified by the Health Department, making it a perfect incubator for start-up businesses. 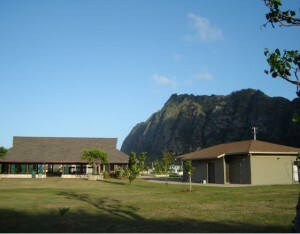 Ka Hoʻoilina Na Kūhiō Community Center in Waimānalo is home to a fully-equipped, commercial kitchen owned and operated by the Waimānalo Hawaiian Homes Association (WHHA). “Since its beginnings, we have seen a multitude of homestead and non-homestead renters, primarily small-business owners,” said Paul Richards, President of the Waimānalo Hawaiian Homes Association (WHHA). The WHHA owns and operates the community kitchen, and the proceeds from kitchen rental fees help cover operating costs, including electricity, gas, etc. This kitchen has something in it for everyone: small-business owners, homesteaders, and the WHHA. Paul calls Keoki their “star vendor,” a label Keoki should be very proud of.